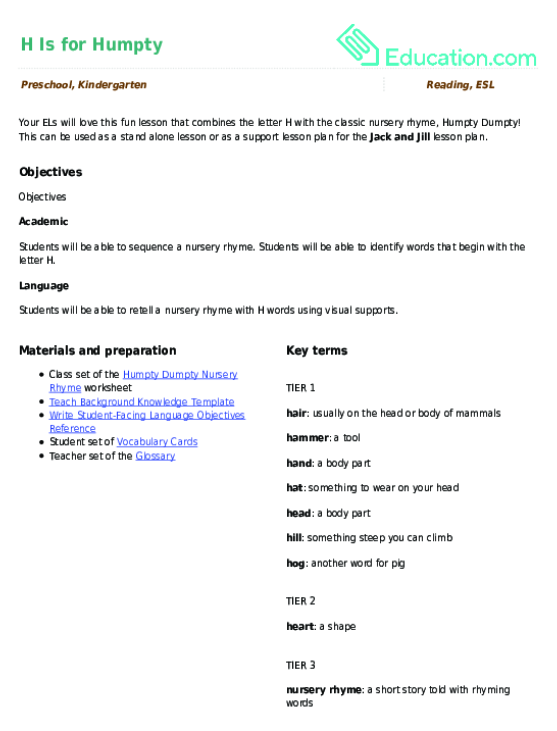 This lesson can be used as a pre-lesson for the Jack and Jill: Letters and PicturesLesson plan. Hair: Usually on the head or body of mammals. Students will be able to sequence a nursery rhyme. Students will be able to identify words that begin with the letter H.
Students will be able to retell a nursery rhyme with H words using visual supports. Prior to the start of the lesson, pre-write the text for Humpty Dumpty on the board or chart paper. Cover it. Ask the class to sing the ABCs along with you (as you sing, point to a class alphabet chart), stop singing at the letter H.
Say, ""This is the letter H. The letter H makes the /hhh/ sound like this. There are many words that start with the letter H. Today we are going to learn a funny nursery rhyme that has H words in it."" Display the vocabulary cards and say each name aloud as you show the image, emphasizing the beginning sound (H). 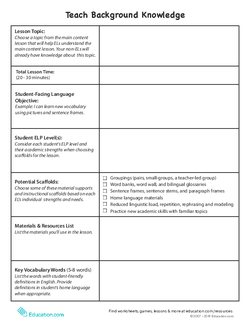 Ask students to turn and talk to share with a partner the new words they heard and what they have in common, or how they are similar. Tell students that all of the words begin with the letter H.
Demonstrate drawing an uppercase H on the board. Model how you start at the top. Have students practise drawing an invisible H in the air with their fingers (or trace an H on the rug). Repeat for the lowercase h, explaining that all letters have an upper and lowercase way to write them, although they make the same sound. Ask students if they can think of any other words that begin with the letter H. Have students turn and talk to share their ideas with a partner using the sentence starter, "________Also starts with H."
Encourage pairs to share their words aloud (check that all words start with the letter H) and record the words on the board for reference. Explain that now you will be reading a nursery rhyme that has H words in it. Define a nursery rhyme as a short story (often silly) that has rhyming words in it. Tell students that today's nursery rhyme is about a funny character named Humpty Dumpty. Reveal your pre-written text to the class. Point to each word of the rhyme as you read it aloud, pausing at the H words and underlining them (while displaying the image) to the class. Ask students to repeat each line after you as you read it a second time. Explain that the class just retold the story using their own words. Ask for student volunteers to come up and act out the nursery rhyme as the class reads it again. Assign roles (e.g. Humpty, Wall, Horses, Kings Men). Read each line aloud again (having students either repeat after you, or chorally read with you). While you are reading, have students practise acting out the story silently. Have students come up and point to the words in the rhyme that begin with the letter H.
Provide a picture sort of H and non H words for students to practise identifying which words begin with the letter H.
Put students in a small group and have them practise acting out and retelling the nursery rhyme in their own words. Encourage students to share additional sentences using H words. Provide a second nursery rhyme for them to retell in their own words. Pass out the worksheet and have students circle all of the H words. Then have them practise retelling the story to a peer. 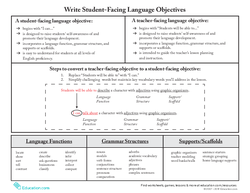 Take note of any students who are struggling to connect the sequence of the story as they retell it. Pull these students aside for follow up. As students are sharing their H words (in the prior section) note if any students have misconceptions and/or challenges identifying H words. Gather the class back together and review the importance of listening closely while reading to be able to retell a story. As an exit ticket, have students share an H word with the class using a complete sentence. Your ELs will love this fun lesson that combines the letter H with the classic nursery rhyme, Humpty Dumpty! Help your preschooler learn the alphabet and practise letter H sounds all while having fun and coloring! H is for Hat! practise writing the letter H then draw and label two objects beginning with H in the space provided. 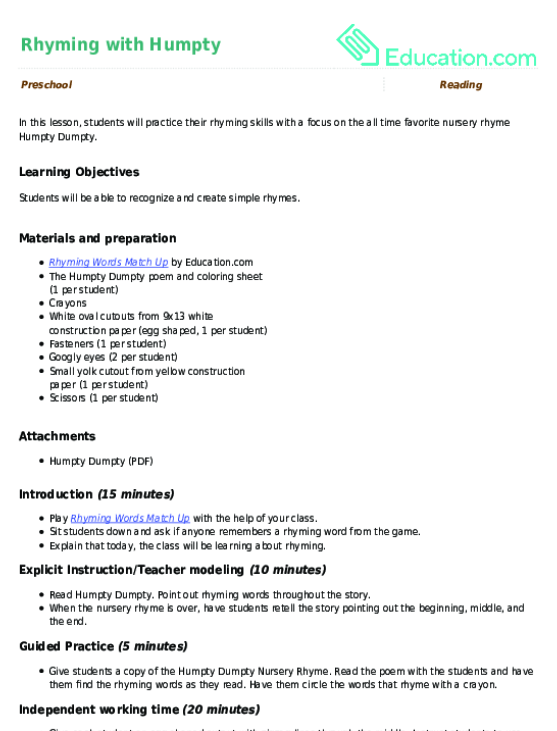 In this lesson, students will practise their rhyming skills with a focus on the all time favorite nursery rhyme Humpty Dumpty. What if Humpty Dumpty wasn't the only one sitting on the wall? Try out a simple subtraction problem using this classic nursery rhyme. 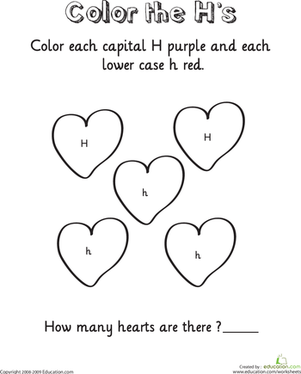 Give your child practise with identifying the letter H with this printable worksheet. 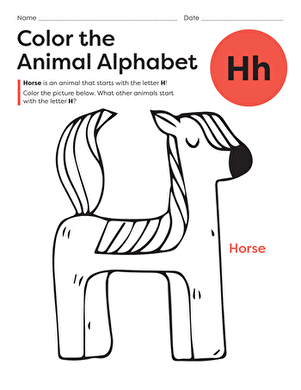 Year one students will have a great time learning all about the letter H in this alphabet-centered lesson plan! Have a ball with the letter H in this connect-the-dot way to reinforce alphabet learning. 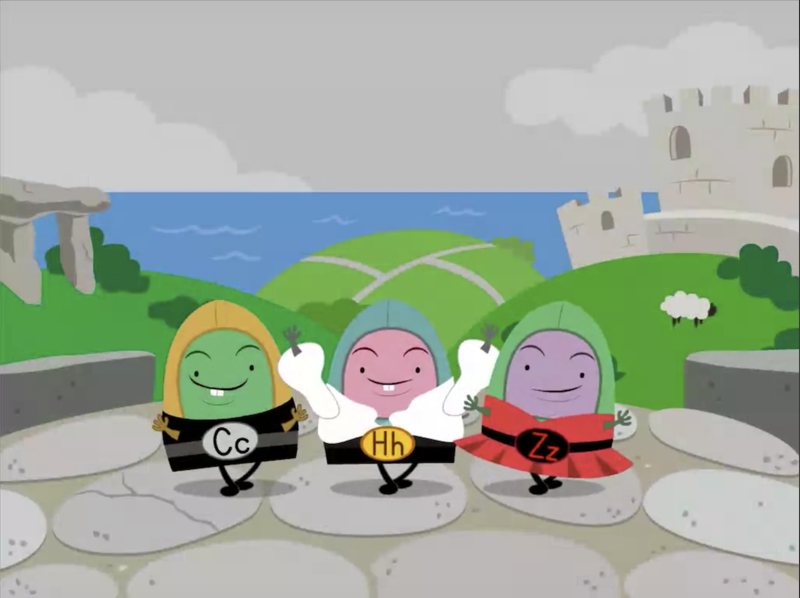 Three costumed Muggos will teach your students to recognise letters C, H, and Z with their majestic river dance! Use this well-loved nursery rhyme to help your year one students identify the letter A.